The famous 80’s movie Footloose, starring Kevin Bacon, has been skillfully adapted for the stage by Dean Pitchford and Walter Bobbie and is currently touring the UK. We went to see Footloose at the world famous Blackpool Opera House, an impressive theatre seating almost 3000 in the centre of Blackpool. The theatre is quite close to where we live so it doesn't take long to get there. We park on a nearby car park which cost £3.00 and it was only a quick walk to the theatre. Produced by the Sell a Door Theatre Company, the big names in the cast are Gareth Gates playing Willard and Maureen Nolan as Vi Moore, the reverend’s wife. The play, based on a true story, follows teenager Ren McCormack, (Luke Baker), after his move from Chicago to Bomont, a small Midwestern town where dancing is banned. He is soon spotted by Ariel, the rebellious daughter of strict minister Rev. Shaw Moore and courageously battles to abolish this unreasonable ban and succeeds in staging the first high school prom. The entire cast was very strong and performed their roles with energy and enthusiasm. The show was very well choreographed by Matthew Cole, making full use of the set for some impressive dance moves. The real stars of the show for us were Luke Baker and Hannah Price playing teenagers Ren McCormack and Ariel Moore. 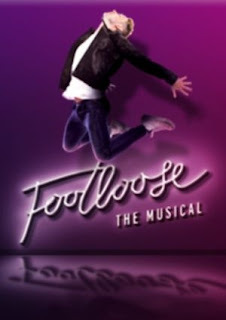 Footloose is Hannah’s first professional role and judging by her performance she is certainly someone to watch out for in the future. Her voice was clear and her singing was fantastic. Surprisingly Gareth Gates, who gave a strong comic performance as Willard has the lead in only one song. Where Luke plays the role of a determined worldly wise young man Gareth is excellent playing the naive country boy. It was good to see Gareth's acting skills but we were expecting more songs from such a famous singer. Music is obviously central to the show with around half the numbers from the original film and the rest written by Tom Snow with lyrics by Dean Pritchard. The cast play all the instruments on stage, which whilst undoubtedly impressive was also distracting at times. At the out of town dance it makes perfect sense to have a band on stage but why would the characters be playing instruments at the town council meeting? The Opera House has a large stage and this was filled with the excellent set which quickly transformed from church to school to burger bar and back again. Costumes were great bringing a real 80’s feel to the night. The highlight of the show for the women in the audience had to be the part where Gareth is stripped down to just a pair of tiny denim shorts in the Bonnie Tyler song Holding out for a Hero. We did feel that the show was a little slow to get going, probably more to do with the story than the performance of the cast. Following the interval the pace began to step up culminating in an energetic finale where the entire cast took to the stage for the high school dance. The audience finally got into the spirit of the night and rose to their feet for a final rendition of Footloose. We had a great night out and it was great reliving our teenage years and hearing all the 80’s songs again! Disclaimer - we received free tickets for the purpose of this review but all words and opinions are our own.